Habit: Annual, tufted, in youth submersed, in age +- emergent; roots fibrous. Leaf: 5--20(45) cm, 1--5 mm wide, +- elliptic to +- round in ×-section; ligule +- 1 mm, tip +- obtuse or +- notched. Inflorescence: +- scapose, generally emergent, +- dense spike of bisexual and sometimes staminate flowers, (2)6--20 cm, + 2 submersed, sessile pistillate flowers enclosed in leaf sheath at base of scape. Staminate Flower: perianth part 1, 2--3 mm; stamen 1. Pistillate Flower: perianth 0; carpel 1, style 6--20 cm, thread-like, stigma floating, head-like. Bisexual Flower: perianth part 1, 2--3 mm; stamen 1; carpel 1, style generally short. Fruit: achene, 2--10 mm, ribbed, +- flat, +- winged in bisexual flowers, angled in pistillate flowers, tip truncate with off-center beak. Chromosomes: 2n=12. Ecology: Vernal pools, streams, ponds, lake margins; Elevation: < 1700 m. Bioregional Distribution: NCo, NCoRI, SN, GV, CW, SCo, PR, GB; Distribution Outside California: to western Canada, Montana, Mexico, Chile; naturalized in Australia, Iberian Peninsula. Flowering Time: Mar--Oct Note: Previously in Lilaea, yet highly nested in Triglochin, a paraphyletic genus made monophyletic by inclusion of this sp. (von Mering & Kadereit 2010). 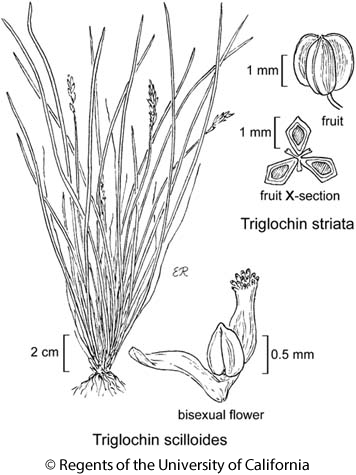 Unabridged Note: Previously in Lilaea, sometimes in Lilaeaceae, but evidence from molecular biology, embryology, cytology, palynology indicates close relationship with Trigochlin, a paraphyletic genus made monophyletic by inclusion of this sp. (von Mering & Kadereit 2010). Citation for this treatment: David J. Keil 2012, Triglochin scilloides, in Jepson Flora Project (eds.) Jepson eFlora, http://ucjeps.berkeley.edu/eflora/eflora_display.php?tid=91083, accessed on April 19, 2019. NCo, NCoRI, SN, GV, CW, SCo, PR, GB; Markers link to CCH specimen records. Yellow markers indicate records that may provide evidence for eFlora range revision or may have georeferencing or identification issues. Purple markers indicate specimens collected from a garden, greenhouse, or other non-wild location.